remember that one time i told you i was in san luis obispo? it ended up being a pretty good weekend. after i left the coffee shop and ate all my french fries, i walked around, went to splash cafe for their famous clam chowder, and called it a night. the next morning, my roommate and i caught up with all the other church folks in town, walked around downtown again, got lots of coffee, food, and acai bowls. i think being in slo reminded me of a college life i kinda wish i had. don't get me wrong, i enjoyed college and am thankful for those memories, but the vibes in SLO are so different. it's relaxing, hip, and chill, with good weather, coffee, and vibes. i do admit, i am a bit biased since i've heard so many great things about slo from c and his friends, but i've gone to slo a handful of times over the past couple years, and it's never failed me. the reason why i mention all this about SLO is because there's a well-known coffee shop there called Scout Coffee. It's hip, the coffee is pretty decent, and it's a great hip spot to hang out, read, study, and be hip. did i mention that it's super hip? it's so hip. it's the hipster i'll never be. I swear it sounds like I'm a scout sponsor, but they had this cookie there called a scout cookie, which was basically a large cookie studded with chocolate, pecans, and oats. i enjoyed the combination, so i wanted to create it when i got back. and so i'm calling this one a scout cookie because it'll always remind me of the cookie i got at scout coffee. it's not quite the same, but i'd say it comes pretty close. 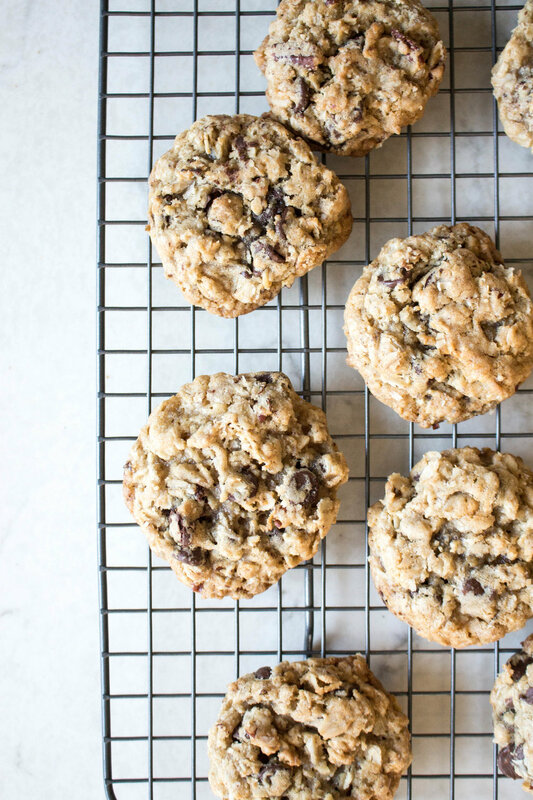 it's sweet (of course, not too sweet) and chewy, and there are a lot of different textures there with toasted pecans, oats, and chocolate. The sea salt flakes on top and hint of spice balances it all out, making it a great scout cookie, scout's honor. baker's notes: play around with the mix-ins, swap out some of the pecans for dried fruit or other nuts, or try different types of chocolate. 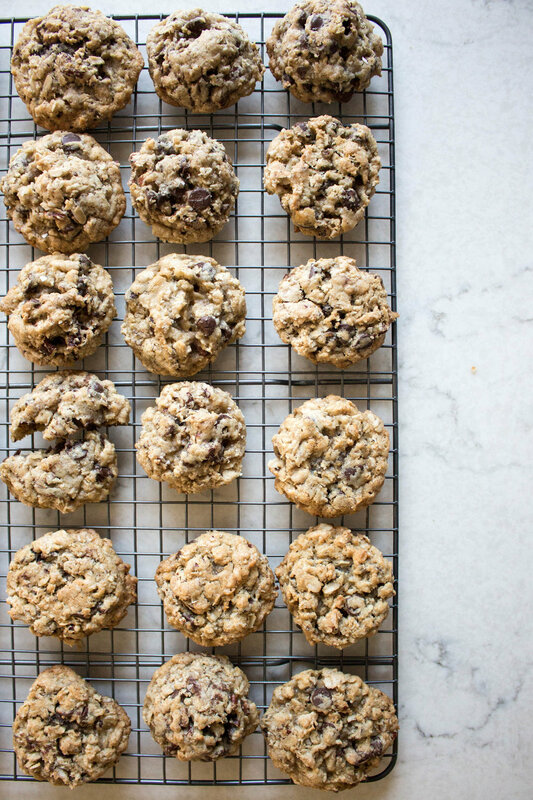 keep the oats though, i think that's what makes these cookies the hearty cookies they are. the dough also freezes well, make the dough, shape into balls, freeze on a cookie sheet, and throw them into a ziploc bag. bake as directed in the recipe-no need to thaw the dough balls-just add a couple minutes to the baking time. preheat oven to 350 f. line a baking sheet or two with parchment paper or a silpat; set aside. in a large bowl, cream together the sugar and butter. beat until creamy, about 3-4 minutes, if using a stand mixer (a little longer if you're doing this by hand- bless you). add eggs, one at a time, mixing after each addition. stir in the vanilla extract. 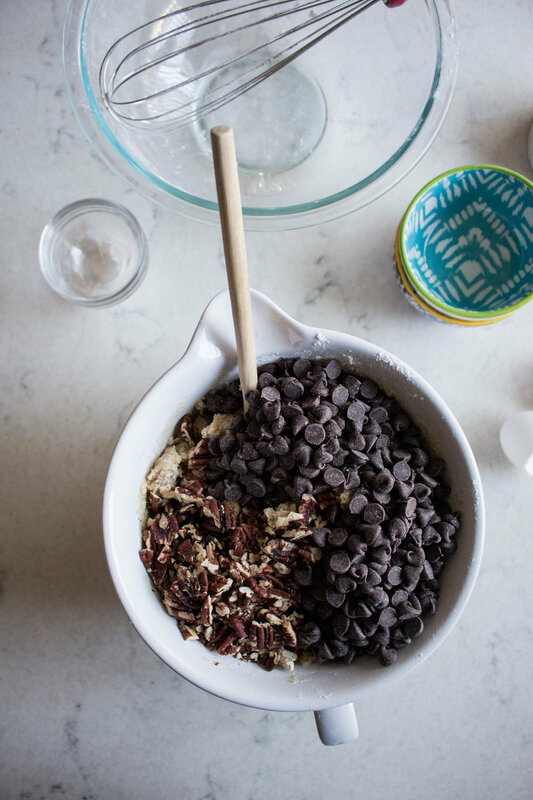 in a medium bowl, stir together the oats, flour, baking powder, baking soda, spices, and salt. mix into the wet ingredients, and mix until just incorporated. 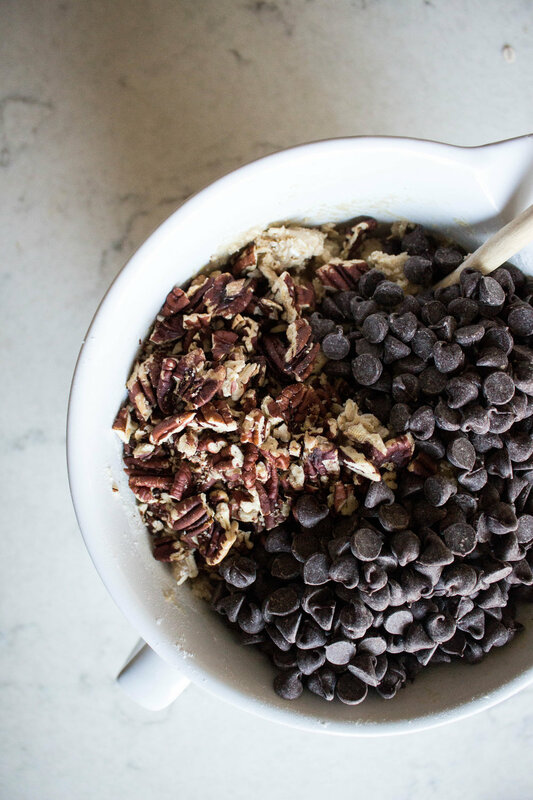 stir in the chocolate chips and toasted chopped pecans. 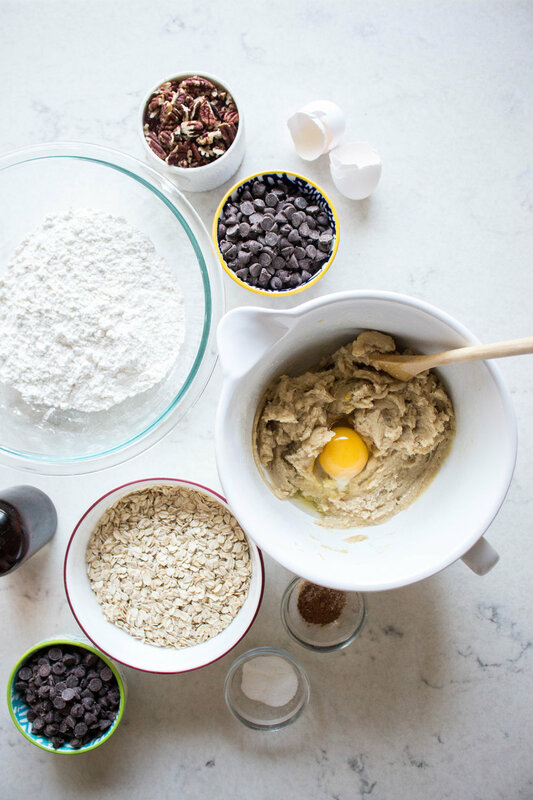 scoop 1.5 tablespoons of dough for each cookie (or more or less, depending how large you want your cookies to be). place dough balls onto prepared baking sheets, and bake for about 10 minutes (more or less, if your cookies are larger or smaller) until lightly browned. once you pull the cookies out of the oven, lightly sprinkle the tops of cookies with sea salt flakes, if using. enjoy warm!! !